General oblique aerial view centred on the reservoir, taken from the E.
Oblique aerial view centred on the dam, taken from the WNW. 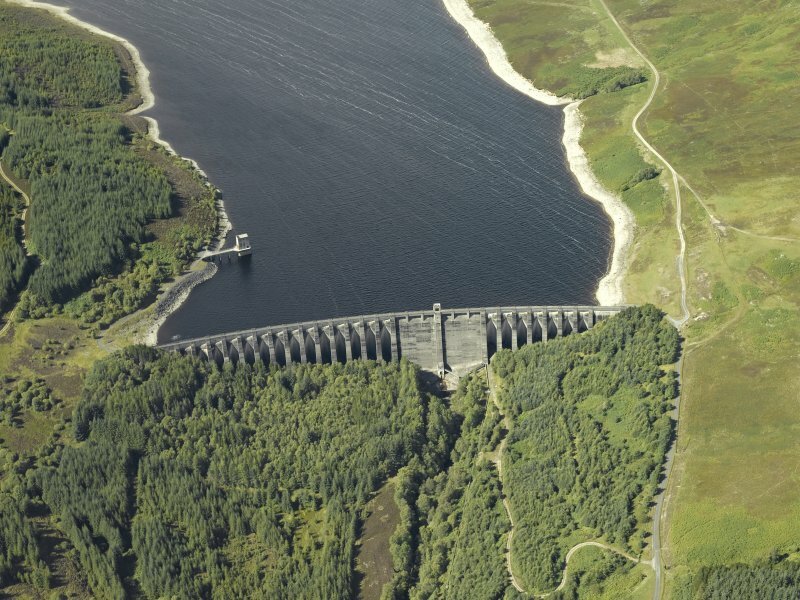 Oblique aerial view centred on the dam, taken from the SSE. Oblique aerial view centred on the dam, taken from the SE. For (associated) Errochty Reservoir (Loch Errochty), see NN66NE 8. For (associated) Errochty Power Station (NN 7727 5929), see NN75NE 79. For (associated) Errochty Switching Station (centred NN 7695 5909), see NN75NE 80. Loch Errochty Dam, 1955, North of Scotland Hydro-Electricity Board. Spectacular diamond-headed buttress structure, 354m long and 49m high, built across the River Errochty to form the man-made reservoir of Loch Errochty (NN66NE 8). 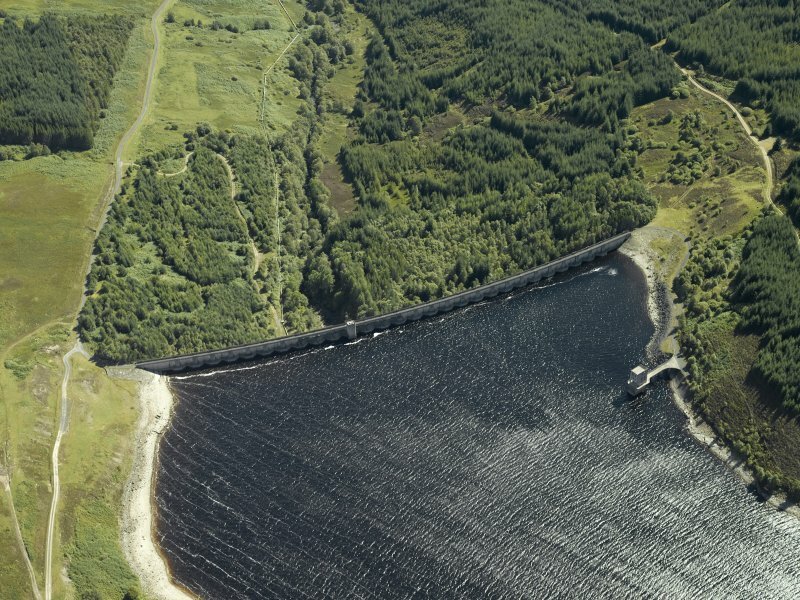 Water is fed to the loch from the River Garry and its upper tributaries by 19km of tunnels; a further 9.6km tunnel supplies the Errochty Power Station (NN75NE 9). (Name cited as Trinafour, and date as 1957). 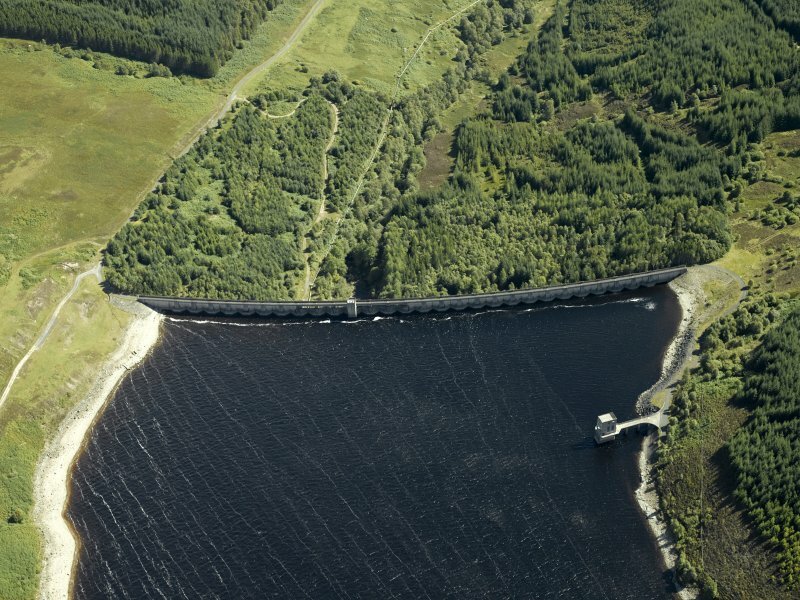 This diamond-headed buttress dam was built at the E end of Loch Errochty as part of the enlarged [2nd] phase of the Tummel catchment area scheme; there was a tunnel from this dam to Loch Tummel via the Errochty power station. The contractors were A and M Carmichael Ltd. The average annual output of the Errochty scheme is 100 million units. 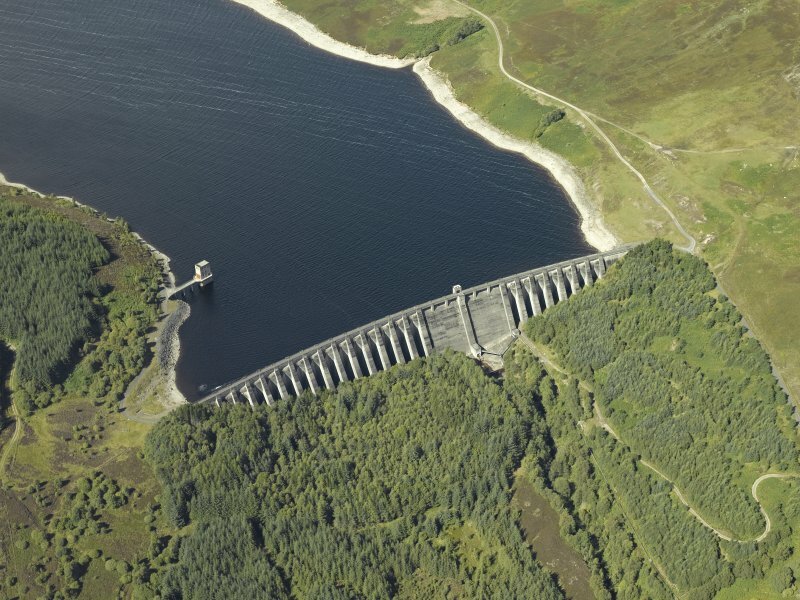 This structure dams the E end of the Errochty Reservoir (NN66NE 8) and forms part of the Tummel Hydro-Electric Scheme. It falls entirely within the parish of Blair Atholl. The location assigned to this record defines the centre of the structure. The available map evidence indicates that it extends from NN c. 71335 65402 to NS c. 71487 65752. Information from RCAHMS (RJCM), 29 December 2005. Part of the Tummel- Garry Hydro Electric Scheme. 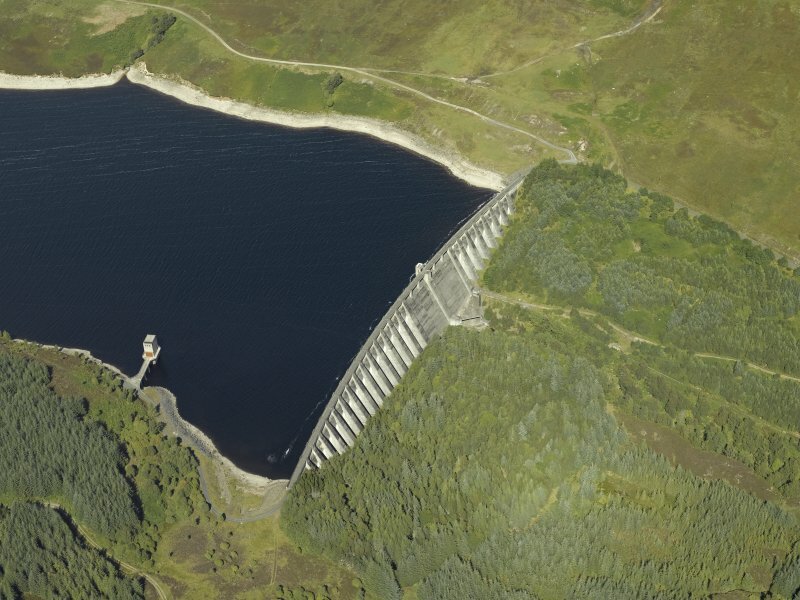 Errochty Dam is a 127 ft high, 1310 ft long diamond-headed buttress dam completed in 1957 which formed a new three mile long reservoir with a top water level 1080 ft above sea level. from Loch Errochty to the Errochty power station whichis discreetly situated in a hillside excavation on the shore near the western end of Loch Tummel. turbines operating on a head of 610 ft. This spectacular dam provides storage and flow regulation for Errochty power station (in addition to a small degree of generation on the compensation water at Trinafour). The dam is diamond headed and heavily buttressed with a walkway to the top oversailing the fixed spillway. There are various wave walls and agitators to the base of the dam to control the water flow when it is at spill. Water is supplied to the dam from the headwaters of the River Garry via some 19 km of underground pipes and tunnels. The intake to the tunnel which takes water through to Errochty Power Station (see separate item) is located to the south end of the dam with an access deck supported on large cylindrical columns. The intake is topped by a gatehouse tower which houses a large roller gate allowing the isolation of the tunnel as required. This dam is relatively large in scale with prominent buttressing to the downstream face and the additional interest of the walkway oversailing the fixed spillway. The dam dominates the view up the glen, blocking off the passage of water to flood the upstream side. 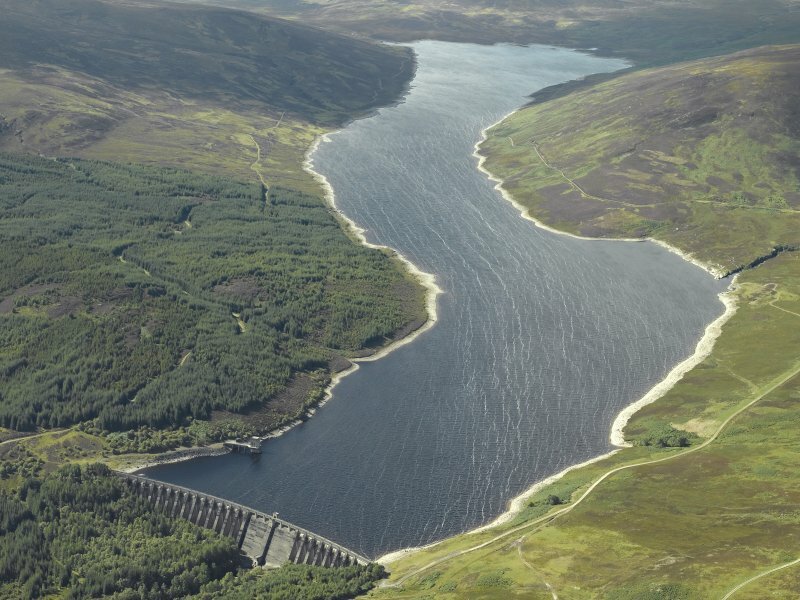 It is an unusual example of a diamond headed buttress dam, designed as such to withstand earth tremors from the nearby Highland Boundary Fault. 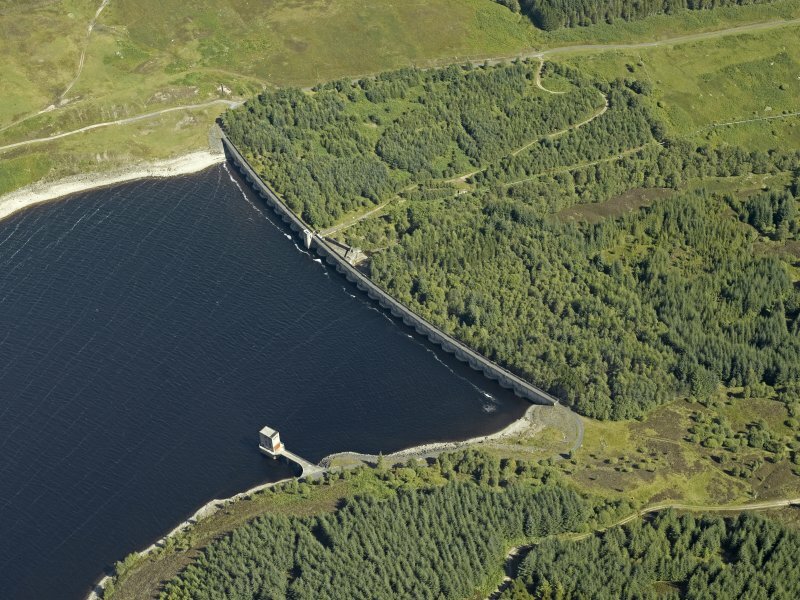 The only other example of this type is Lednock Dam on the Breadalbane scheme (see separate item). P L Payne, 1988; J Miller, 2002, 42: 88918 Scottish Hydro Electric, 2000,18;67483741.